Saint Therese of Lisieux, also known throughout the world as the "Little Flower of Jesus" became a Carmelite nun at the age of fifteen. She died at the age of twenty-four. Saint Therese's life was devoted to prayers for priests and the foreign missions. She is a patron of missionary work done by Catholic priests. Her feast day is celebrated on October 1. Saint Rita of Cascia was born in Italy. She was forced to marry but after her husband's death she became an Augustinian nun. Saint Rita begged our Lord to share His passion with her. One night as she knelt in prayer, a light came from a figure of Jesus with His crown of thorns and pierced her forehead, leaving a mark of a thorn there for the rest of her life. 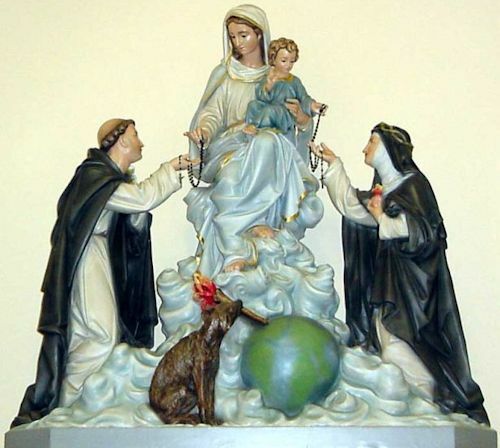 Saint Rita's feast day is May 22. Saint Anthony of Padua is a very loved and admired saint of the Catholic Church. He was born in Portugal but most of his work was in Italy. He first joined the Augustinian Order then later joined the Franciscan Order in the hope of shedding his blood and becoming a martyr. He lived only ten years after joining the Franciscan Order. He was thirty-six years old when he died. Saint Anthony's feast day is celebrated on June 13. Saint Jude was one of the Apostles of Jesus who traveled great distances to preach the Gospel of our Lord. Saint Jude was martyred by being clubbed to death. Saint Jude is the author of one of the Epistles in the New Testament. His relics, along with Saint Simeon's, who was his brother, were placed in the Vatican in Rome, near the relics of Saint Peter and Saint Paul. Saint Jude's feast day is on October 28.
and St. Catherine of Siena. 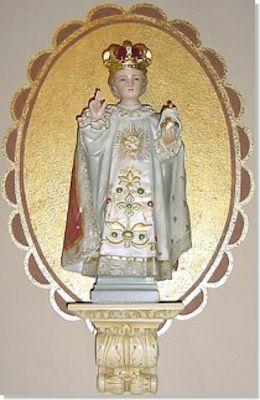 The statue of The Infant Jesus of Prague is located above the baptismal font.